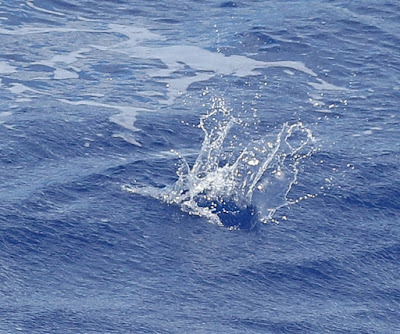 While the Seabirds were certainly quiet today as we were roughly half way between Tristan da Cunha & St Helena, it was still a memorable day. 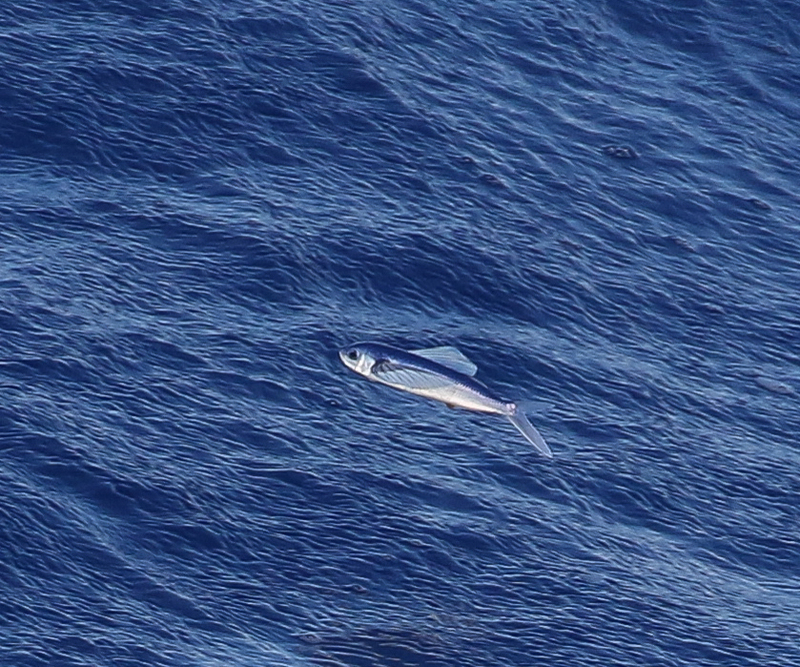 Already I had seen my first Atlantic White Marlin. 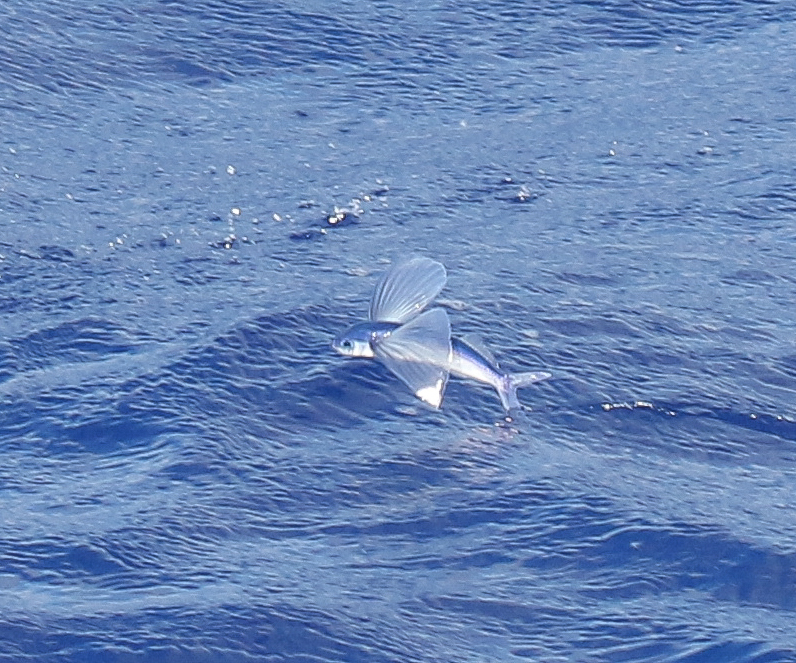 On the first full day at sea after leaving Tristan da Cunha, I had seen a few Flying Fish. However, we encountered a lot more today & there were plenty of opportunities to try to capture a few photos. We seemed to see two main species of Flying Fish. The larger ones were roughly a foot long & were feeding individually or in small groups. 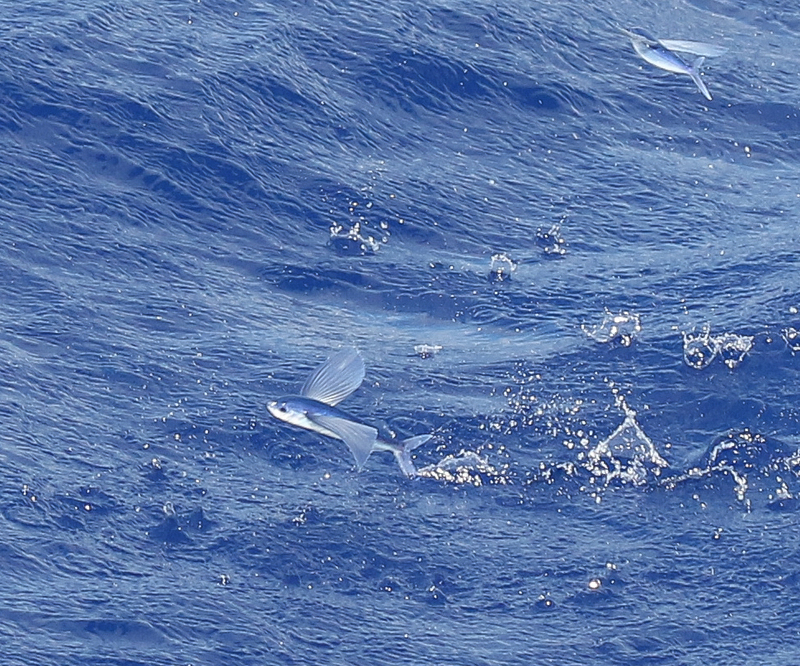 The smaller ones were roughly half that size & we could disturb them in groups of 20 - 50 individuals at a time. 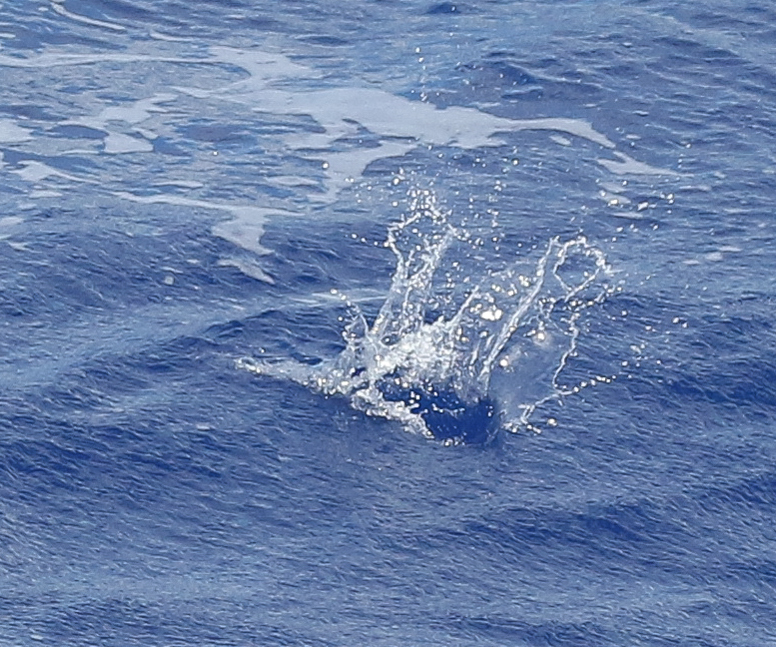 When disturbed, they would leap out of the water & extend their flippers & glide as far as they could. 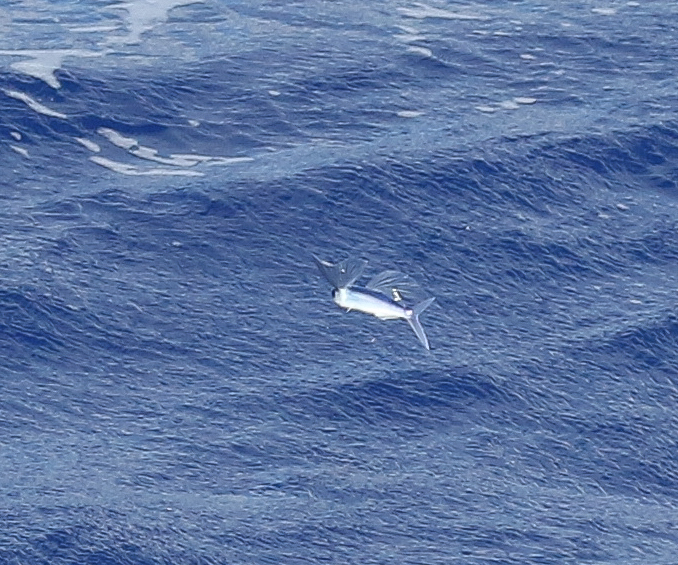 The small ones generally went no more than 20 - 30 metres, before diving back into the water. The larger ones were more interesting. 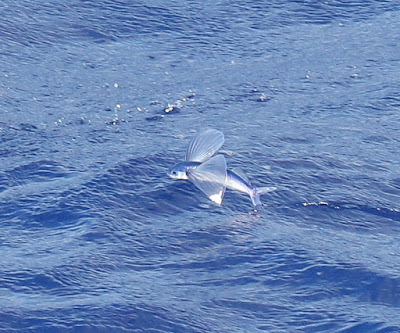 Their initial glide was often not much further, but at the end of their glide, they would dip their tails into the water, flick the tail side to side & this was enough to propel them for a further glide. 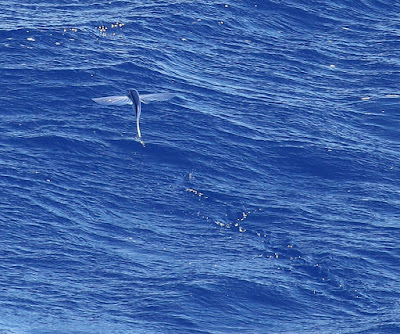 Often they would go for three to five glides, having changed direction a bit after each occasion the tail touched the water, before finally re-entering the sea. 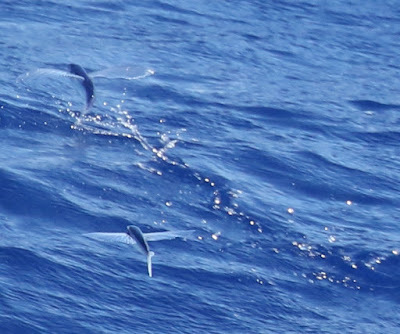 The best place to try to get the best photos of Flying Fish was the bows. The sea was generally fairly calm, with little chance of a rogue wave soaking you & more importantly the camera in salt water. 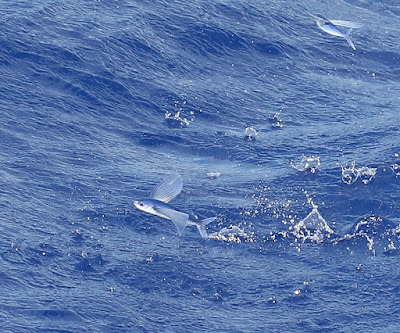 Additionally, there was the best chance of seeing the Flying Fish just as they were starting to leap out of the water & you were generally closer to them. However, the bows were too low to generally spot Cetaceans & coupled with the likelihood you would be focusing on the first 20 metres, then it was a poor spot for Cetaceans. I decided to stick with watching from one of the bridge wings, choosing the side with the better light & trying to get out of the wind. It was not always possible to achieve both for a morning & afternoon, but generally I stuck to my preferred side till lunchtime & potentially swapped sides over lunch. 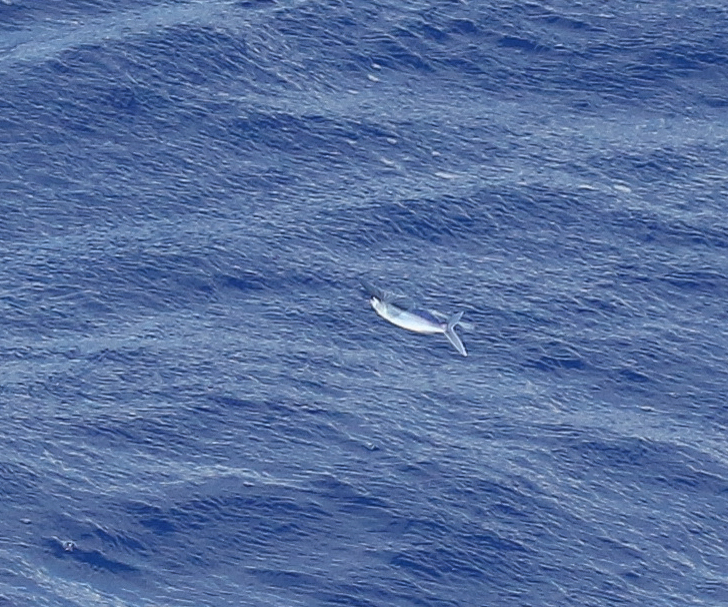 This was a good compromise for both Cetaceans, as well as, Flying Fish. 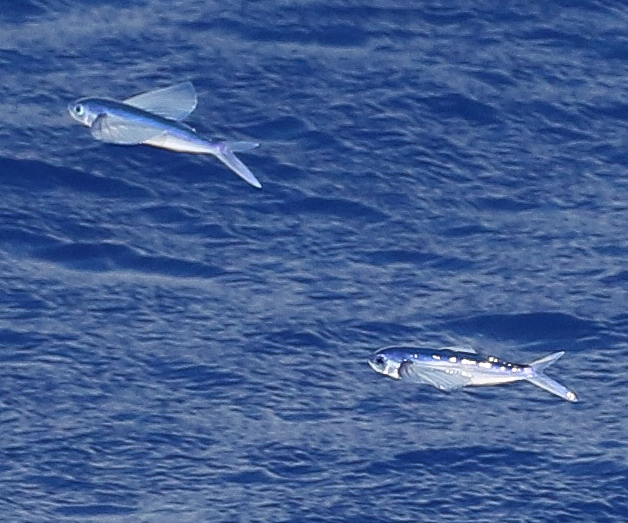 Even if you didn't have much interest in the Flying Fish themselves, they certainly helped to sharpen people's photographic skills, as you had only a few seconds to grab some photos before they were either too far away or had submerged. 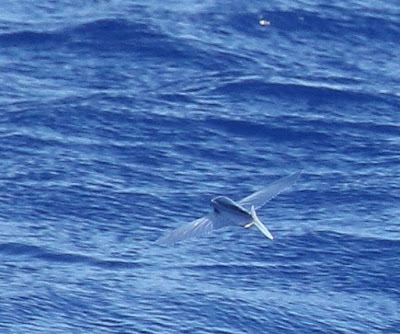 I wasn't happy about my camera settings as many of the photos were out of focus (as they had been for the Petrels & Shearwaters earlier in the Odyssey). It was about this time Marijke suggested changing one of the camera settings to refocus for each photo. Up to that point, the focus wasn't being recalculated as long as I kept the finger on the button. 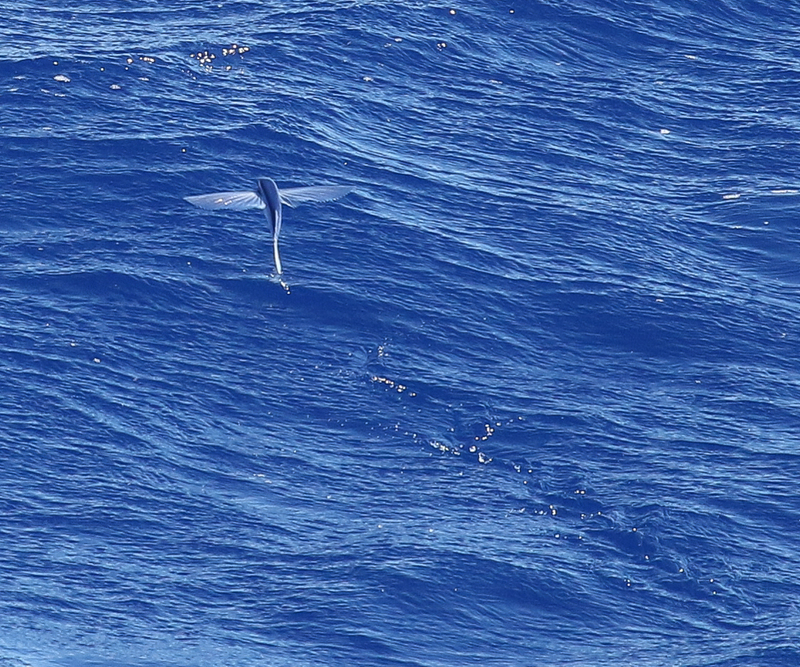 This was fine for static subjects, but little use for Seabirds or Flying Fish in motion. This certainly helped to improve the hit rate of in focus photos. Another setting I didn't have correct was getting the exposure correct for just the central of the photo. This also helped to improved the quality of my photos. This was yet another example of learning on the Odyssey. There were so many knowledgable people on board who had a lot of experience of identification, Seabirds, Cetaceans, other sealife, photography etc that it was a good place to learn. Perhaps some of the others on the Odyssey will learn the importance of packing an insulated coffee mug for the next trip. I can remember seeing my first Flying Fish. It was Nov 1991 & I was on a round the world trip with Birding mate, Keith Turner. We were in Indonesia as part of a 3 month trip to the country in the second half of 1991 (spread over 3 different entries to get around the 2 month visa rule). We succeeded in visiting most of the islands that the Bird Tour companies now visit over several tours. Generally we flew between islands, but had to take an inter island ferry to get from Ambon to Seram. On this inter island ferry, we saw a number of Flying Fish. 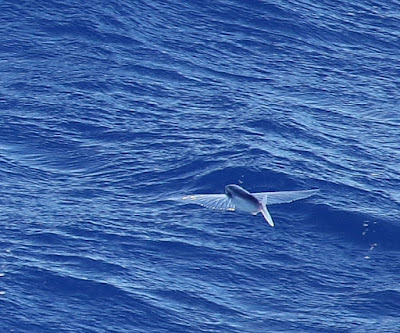 My notes say they went around 20 metres, before dipping their tails into the water, flicked the tail & then starting another glide. 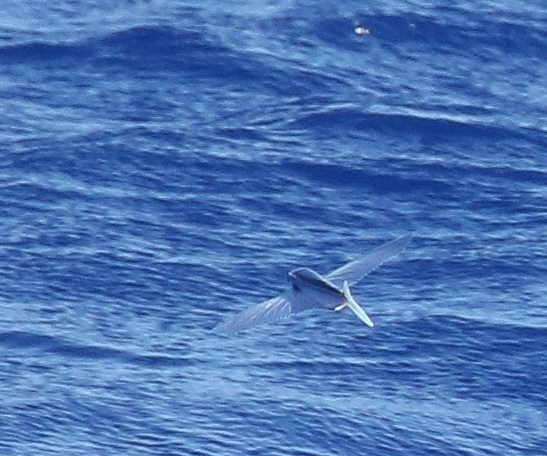 The total distance was sometimes as far as 80 metres in flight. 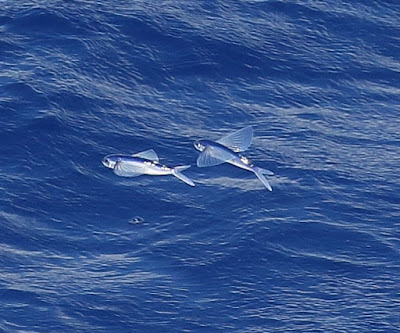 I didn't note their size, but I seem to remember it was around a foot: so they were one of larger, multi-gliding species. However, we never had much time to get onto them, before we lost them. 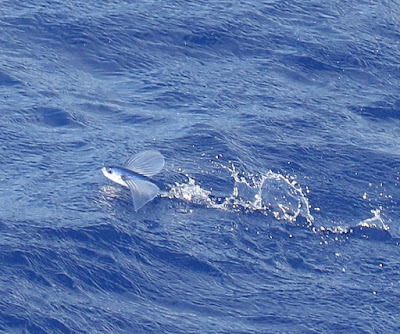 Little did I know then that I would be able to get relatively high qualify photographs that would allow me to enjoy & identify the Flying Fish I was seeing 27 years on. Due to weight of field guides for the trip, I had decided to only take my small point & press camera for that leg of the trip. Not that my main camera, a primitive Olympus OM1 film camera with a 500mm Tamron lens, manual focus & only being able to take only one photo at a time would have stood a chance at getting any photos. Modern cameras have revolutionised photography & identification. The next problem was identifying them. I didn't get to many of the daily lectures on the Plancius as I generally wanted to be on deck. 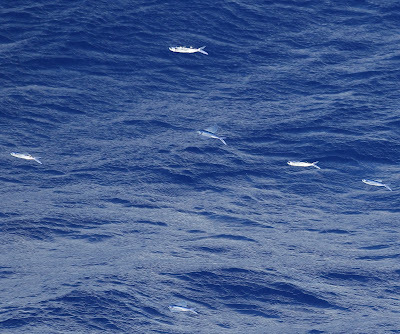 However, Marijke did give a talk on Flying Fish on the following day & I decided that was one talk that I really needed to attend. 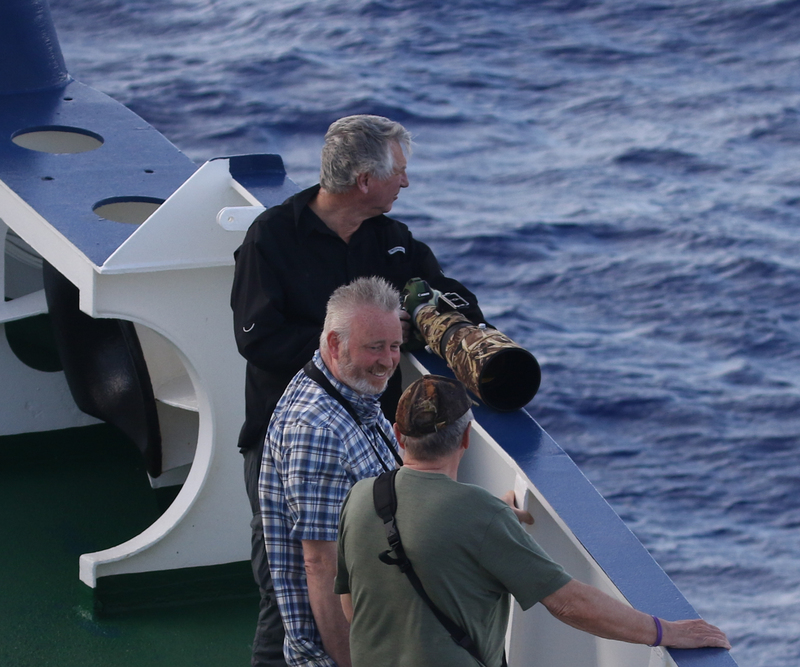 The good thing was Marijke & Hans were sharing duties on deck & Hans was ready to interrupt the talk if there was a good Cetacean sighting. So I was safe in the knowledge that we would hear about anything really good seen during the talk & with careful seating I could be quick out of the door & onto the deck. 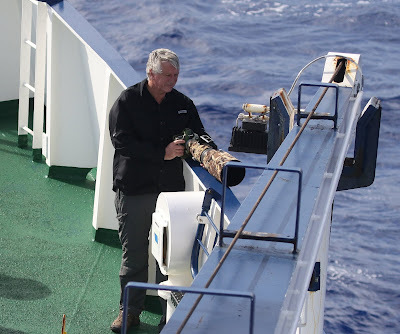 The Flying Fish talk wasn't interrupted, but when Hans interrupted one of Marijke's subsequent talks on Turtle Id with an Orca sighting, I was second on deck. 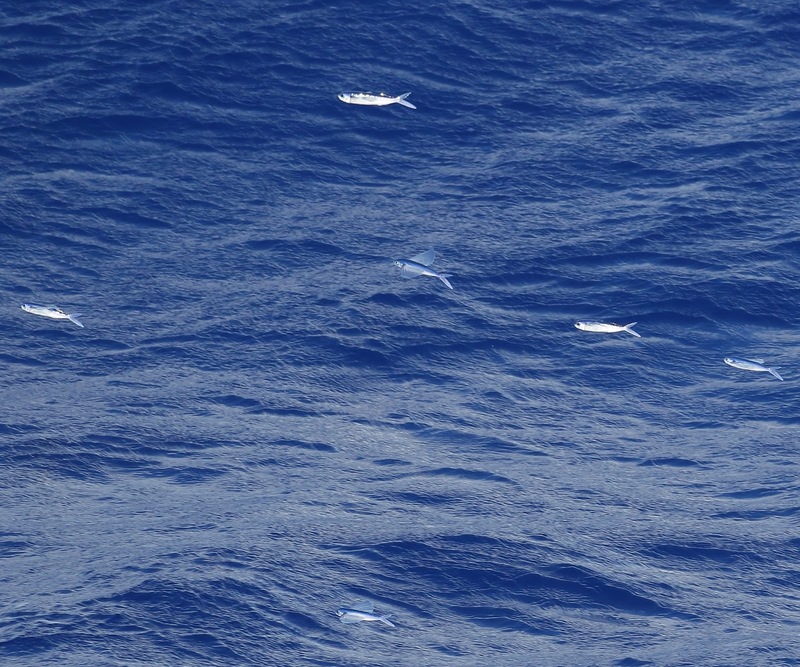 The Flying Fish talk was based upon an identification pdf guide that Steve Howell & colleagues had written on Flying Fish identification based upon a Western Pacific Odyssey trip in Apr - May 2008. This was a trip from New Zealand up to Japan: so similar to our Odyssey except for the ocean involved. They had photographed as many species as possible on that trip & then tried to give them names. Clearly the naming process had taken place late at night & involved a fair bit of alcohol. However, this identification guide is a good starting point. 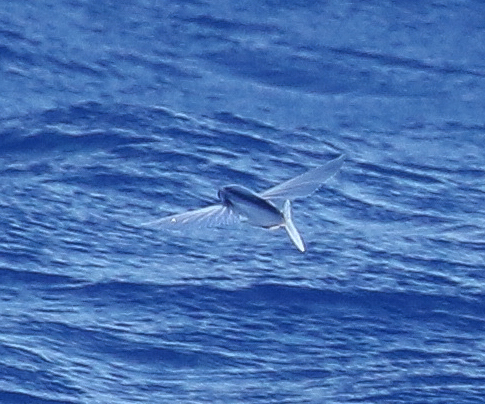 While it was based upon the Tropical Pacific, most of the Flying Fish species we saw seemed to be in it. However, it is still a subject that is probably in its infancy & even the quality of the cameras has improved significantly in the last decade. As more photos emerge then it would be good to think that this will help to extend the knowledge of Flying Fish identification. The Flying Fish pdf can be downloaded by searching in Google for "A working guide to flyingfish of the Western Pacific Odyssey". 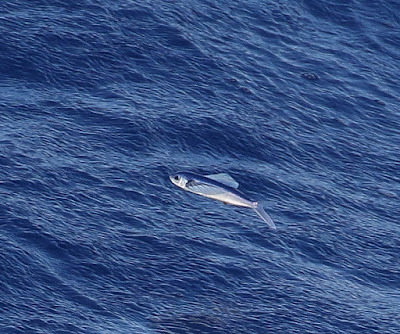 Clearly, there is an assumption that similar looking species in the Atlantic will be the same species as found in similar latitudes in the Pacific. What is missing in this pdf are any scientific names, so it has not been possible to date to map these photos back to known specimens. This is probably not surprising given the difficulty of trying to preserve Fish and keep their actual colourations. It would be great if this could be a goal for a future identification guide, as well as, extending the knowledge of Flying Fish from other oceans. 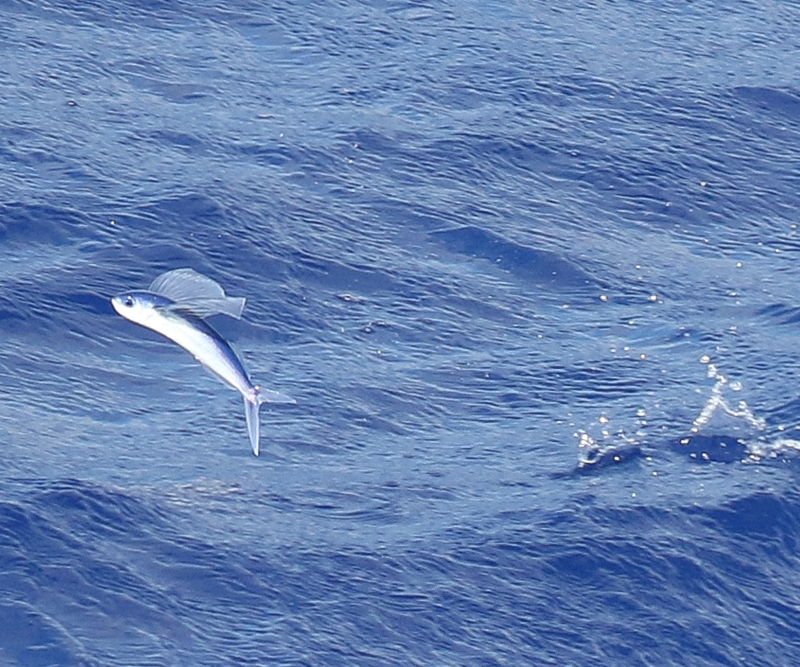 Steve Howell has also written a general introduction to flying fish in his book "The Amazing World of Flyingfish". This is an inexpensive & pleasant read, but it isn't an identification guide. In the Flying Fish identification pdf Steve Howell describes Small Clearwing as small, two-winged with broad clear, triangular forewings and a pink body stripe. It occurs between 10 and 18 degrees South. 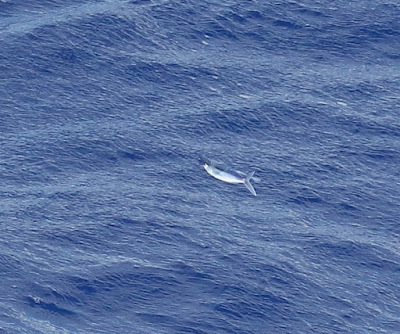 At 08:00 we were 29 degrees 23 minutes South (24 hours later we were at 24 degrees 50 minutes South), so clearly we were seeing this species further South than Howell et al found in the Pacific, assuming that this species also occurs in the Atlantic. But without scientific names in the identification pdf, it is not easy to look into this further. 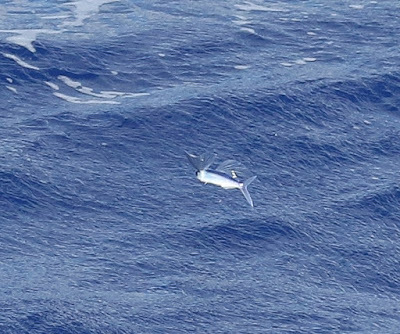 Subsequent searches on line suggest the scientific name might be Exocoetus volitans which the IUCN Red List describes as widespread in tropical & subtropical zones in all oceans.